The community gathers on the frozen river. "Seeing the River" is a specially curated exhibition at Vermont Center for Photography this month that celebrates the Connecticut River, the backbone of the town of Brattleboro and a source of inspiration and meaning for the community. The exhibition is a component of the NEA-funded public art project From the River, To the River, created for the town of Brattleboro by artists Elizabeth Billings, Evie Lovett, and Andrea Wasserman. Five interrelated art installations at the Transportation Center and the Riverfront on Depot Street—completed in 2016—were designed to foster a closer visual, physical, and emotional connection between the town and the river. This show at VCP, an extension of those efforts, includes photographs taken alongside the river and on the island by long-time Brattleboro resident and photographer Robert F. George. A familiar presence on the streets and trails of Brattleboro, Bob recently had a show at In-Sight Photography Project, featuring photos he took of local youth—show materials described him thus: "Bob has witnessed the town evolve in subtle and drastic ways. He photographed snowstorms in the 1990s that brought Main Street to a halt, the annual budding of trees along the Connecticut River, the construction and demolition of buildings including the Paramount Theater and Food Coop." In addition to photographing biking, motorcycle shops, and Brattleboro's downtown and inhabitants, Bob spent twenty years (1984-2004) photographing the banks of the Connecticut River, including Island Park, the island in the middle of the river accessed by bridges to Hinsdale. A hallmark of his work is his exactingly made black-and-white archival prints. 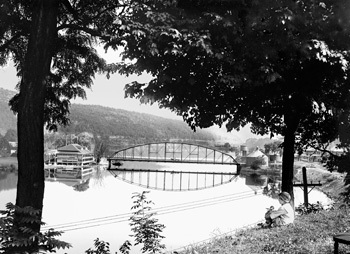 One of many Brattleboro Historical Society images in "Seeing the River"—note the Island Park pavilion at left, 1911-27. 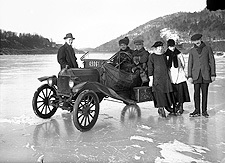 Also displayed in this VCP exhibit are images from the Brattleboro Historical Society, many taken by local resident Benjamin Crown, capturing activity on and in the river in the early 20th century. Billings, Lovett, and Wasserman are also represented in the exhibition by a river-inspired piece in which patterns of water were translated from photographs and sandblasted onto large glass and mirror plates. Pieces of glass with these sandblasted images will be sold to benefit a permanent installation of the River Wall on the Transportation Center, and any photo sales will benefit the Brattleboro Historical Society. Show sponsors include Brattleboro Savings & Loan, Connecticut River Conservancy (formerly Connecticut River Watershed Council), Trust Company of Vermont, and The Richards Group.